Graphic Designer. Visual Journalist. Illustrator. I first fell in love with publication design at my college newspaper, The Daily Evergreen. I worked there from 2003-2007 spending most the time between classes and many a late night at the office in the basement of the Murrow building at Washington State University editing stories and designing pages on deadline. Newseum.com was my homepage and we are a passionate team of college students working on series and alternative story telling. I was lucky enough to be asked to redesign the newspaper during my time. I sat in several different chairs of the office and wore hats from reporter to copy editor to two-time managing editor and spent a summer as editor-in-chief. 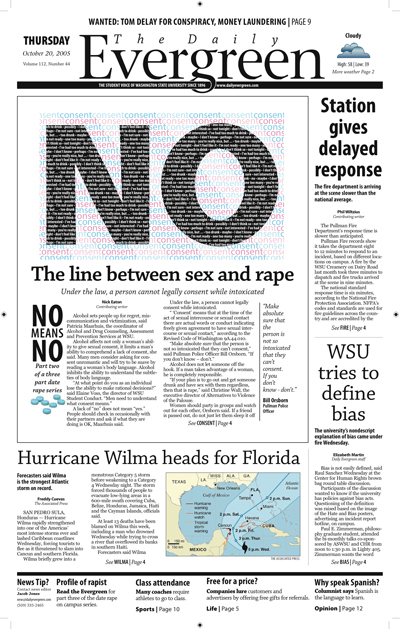 Above is one of my favorite front pages and below is two in a three-part series that won first and third places from the Society of Professional Journalist student awards in design in 2005.